Christophorus Willibaldus Gluck, a Iosepho Sifrède Duplessis pictus (1775). Museum Historiae Artis (Kunsthistorisches Museum) Vindobonae. Christophorus Willibaldus Gluck (Erasbach in vico, 2 Iulii 1714—Vindobonae, 15 Novembris 1787) fuit compositor Germanicus, praecipue musicae operaticae. Ab anno 1736 usque ad annum 1741, Gluck fuit Ioannis Baptistae Sammartini discipulus. Brown, Bruce Alan. 1991. 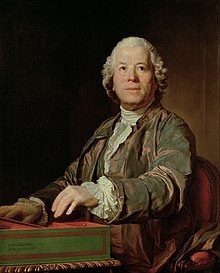 Gluck and the French Theatre in Vienna. Oxoniae: Clarendon Press. Einstein, Alfredus. 1952. Gluck: Sein Leben seine Werke. Turici: Liz-Ausgabe, Orig. Pan-Verlag. Etiam E-Book: www.musikwissenschaft.tu-berlin.de/wi. Novissima mutatio die 16 Augusti 2015 hora 21:10 facta.